If Back to the Future was made today, Doc Brown’s DeLorean would probably be an all-electric powerhouse. While we haven’t heard about any movie remakes in the pipeline, the electric DeLorean is about to become a reality – courtesy of Wired Italy and eCars Now! Italy. According to Wired Italy Features Editor Massimiliano Ferramondo, the electric DeLorean is about week from completion. 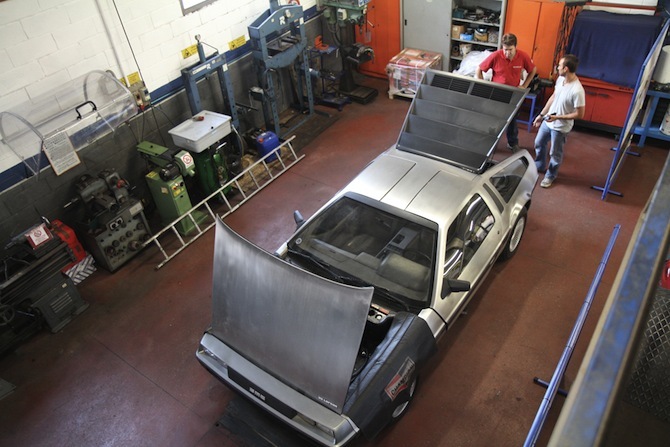 But building the vehicle wasn’t easy – Ferramondo gathered up a 90 kW engine and custom designed Lithium-ion batteries that were molded specifically to fit into the DeLorean. No word on exactly how much juice the DeLorean can squeeze out of its battery before recharging, but we’ll find out soon when the vehicle hits the road with Ferramondo driving it from Milan to Rome. Ferramondo estimates that the car travel between 125 and 135 miles before needing a recharge. Italian speakers and curious eyes can check out the DeLorean’s progress here. As a previous owner of a DeLorean, the engines are fairly gutless. Otherwise, the car is pretty cool and very unique. I always thought it would make a great candidate for an EV. And yes, it will never escape the BTTF jokes...unless you are too young to know what BTTF is. "About to"? It's been done since 2008: http://electricdelorean.com/ And the DeLorean in BttF was gas-powered, and sounded like a (supercharged) gas-powered DeLorean. The "Whine" was from the supercharger, and (As pointed out above and explained in the BttF3) the Car was always gas-powered, it was just the time circuits that required the 1.21GW, which is why when the gas tank was hit at the beginning of BttF3 the car died, and they had to use the train to "Push" it up to speed. Hate to break it to you guys, but the car will need 1.21 Gigawatts to run successfully so you'll need to use plutonium. "This sucker's nuclear?" "No Marty, this sucker's electric. But the only way to get the power necessary to make the temporal jump was plutonium!" Or something to that degree; I'm paraphrasing. The point is that the reason the DeLorean in the films never made a revving gas engine sound--and instead sounded all whirry, like Luke's landspeeder--was that it was an EV conversion. If Back to the Future was made today, Doc Brown's DeLorean would probably be an all-electric powerhouse. While we haven't heard about any movie remakes in the pipeline, the electric DeLorean is about to become a reality - courtesy of Wired Italy and eCars Now! Italy.